(Nanowerk News) Food scientists at the University of Maryland created tiny packages of the spice turmeric and whey protein that could color the way hard-to-absorb drugs are delivered. This false-color image of the spice-laden nanoparticles was taken under powerful microscopes at the University of Maryland Zi Teng, Ying Li, and Qin Wang of the University of Maryland’s College of Agricultural and Natural Resources will publish their results in an upcoming issue of the Journal of Agricultural and Food Chemistry ("Insight into Curcumin-Loaded β-Lactoglobulin Nanoparticles: Incorporation, Particle Disintegration, and Releasing Profiles"). The bright yellow spice was chosen because is an antioxidant and is typical of the kinds of compounds the body finds hard to digest. Whey protein, derived from milk and used in nutrition bars, held the ball together. But the scientists think the real key to making the loaded packages was that they changed the amount of acetone they used in the particles’ preparation– though that un-tasty ingredient was evaporated later in the process. “The nanoparticles could dissolve well in water, but the diffusion of curcumin is very slow, which is known as sustained release," said Zi Teng, the study’s lead author. "These two characteristics, when put together, are favorable for the application of the nanoparticles as a drug or nutraceutical carrier." 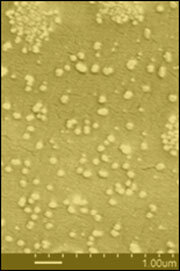 These pictures of the spicy nanoparticles were taken under a powerful microscope in the NISP Lab, part of the University of Maryland’s NanoCenter. The yellow color was added to the illustration. The scientists hope that their finding could lead to strategies for formulating oral medicines for other hard-to-digest compounds.